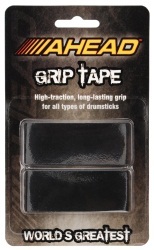 Keep a firm hold on your drumsticks with Ahead's lightweight, durable grip tape. Provides comfortable, long-lasting high-traction grip and shock absorption. Works with all drumsticks, and is reusable! The World's Greatest Grip Tape.